Dr. Katherine Carter is an Instructor at Louisiana State University Health Sciences Center School of Nursing. She received her Associates Degree in Nursing from Olney Central College in Illinois, her Bachelor of Nursing and Master of Science in Nursing from the University of South Alabama School of Nursing, and her Doctorate of Nursing Practice in Public Health Nurse Leadership from the University of Massachusetts Amherst College of Nursing. Dr. Carter is a certified Clinical Nurse Specialist in Public Health. She currently serves as a clinical and theory faculty member in the population focused nursing courses in both the traditional and RN-BSN programs at LSUHSC School of Nursing. Dr. Carter has experience in orthopedics, pediatrics, and medical-surgical nursing. 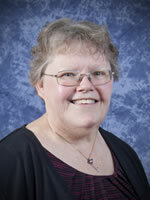 She has extensive experience in home health and hospice. Dr. Carter also has experience as a health facilities surveyor with the Department of Health and Hospitals- Health Standards Section. She has received the DAISY Faculty Award from LSUHSC School of Nursing and is active in her community senior centers and local homeless shelter.